Shiraume Gakuen was founded on a philosophy of compassion and independence. Under these ideals students are encouraged to discover their talents and potential. Our purpose is to send young women into the world who are bright, courteous, elegant and equipped with the tools required to achieve their hopes and dreams. Shiraume Gakuen was founded in 1942 under a strict wartime regime. During this era, education, and in particular women’s education, was of a low standard. The school was founded to overcome this lack of quality and supply a higher education for girls. Since that time, pioneers have come to play a role in shaping the management and education of Shiraume Gakuen. The first and second presidents of Shiraume Gakuen, Shigeto Hozumi and Eiichi Makino were both educated in law at Tokyo University where they eventually became deans. 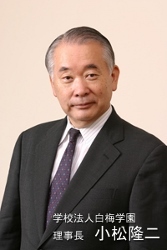 Additionally, Mr. Makino was also conferred the Order of Culture. The teaching foundation at Shiraume Gakuen is known as “Hoiku no Shiraume” (White Plum Nursery). This system was created by Sousaku Kobayashi, a pioneer of modern childcare, who was the inspiration for Mr Kobayashi in Tetsuko Kuroyanagi’s book “Totto-chan: the Little Girl in the Window”. The spirit of Seishu, having inherited this legacy, is to discover the potential of all our students and bring out the best in them. Since the school’s founding in 2006, our students have continued to put all of their effort into studying and producing excellent academic results. We believe students should refine their talents while having fun. We invite you to come and enjoy broadening your mind with us.